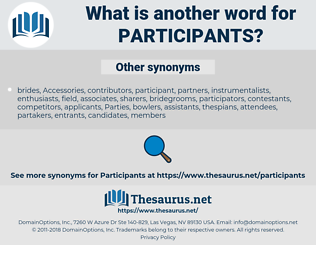 What is another word for participants? two, 28, four, 14, 4, 8, 3.
citizens, acteurs, nations, Programs, Respondents. participating, informants, cooperation, Respondents, co-sponsors, commitment, trainees, secretary, intervening, intern, interns, presenters, perpetrator, Students, internship, Internships, implementation, ontario, chair, ONT, intervenors, organization, Organizations, education, introductions, Caregivers, ministers, N, acting, government, CANPASS, community, professionals, NGOS, employment, responder, responders, Your, provider, providers, women, enjoy, committee, working, rim, INF, work, branch, alberta, review, russian, september, des, people, -lsb-, Got, Had, participation, foreign, Did, drug, Were, have, are, ", trainee, Participated, Mr., panellist, panellists, involved, informant. 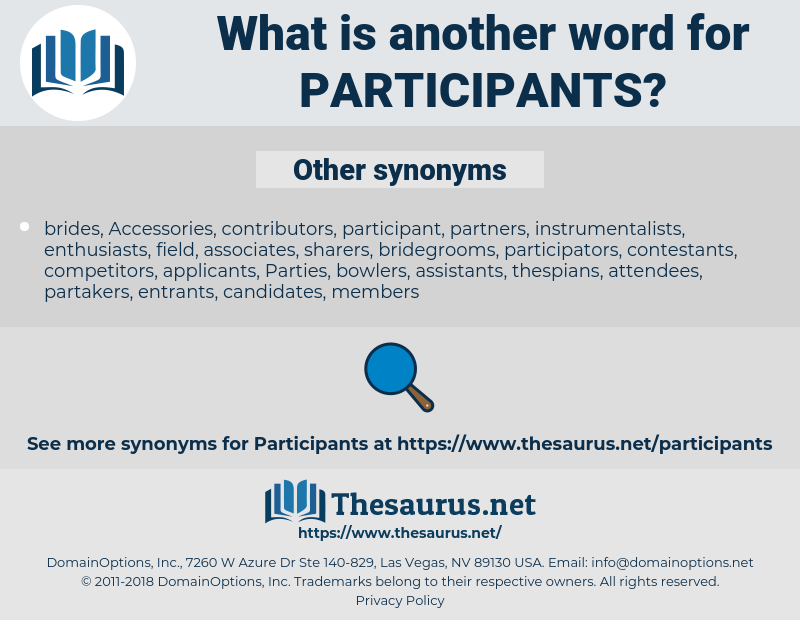 participations, recipients, applicants, discussants, Patients, participates, claimants, partnerships, Parents, participantes, apprentices, proponents, adherents, practitioners, registrants, patterns, Consultants, factors, collaborators, commentators, inhabitants, signatories, components, interviewees, competitors, communications, parts, attenders, Beneficiaries, trainers, commitments, interpreters, entrepreneurs, supporters, instructors, Clients, points, contributions, topics, spectators, engagements, residents, Personalities, teachers, Traineeships, Grants, Researchers, teenagers, citizens, presentations, assistants, negotiators, finalists, Investigators, constituents, servants, techniques, agents, actively, co-chairmen, interlocutors, learners, assistance, compatriots, accomplices, Consultations, subscriptions, matters, deliberations, retrainees, years, where, Chaired, observations, suppliers, declarations, raters, Mentors, occasions, passengers, inmates, experts, perpetrators, demonstrators, demonstrations, initiatives, traders, registrations, intervenants, Operators, experiences, Specialists, attends, comments, victims, gatherings, Parties, exhibitors, interventions, seminars, accommodations, delegates, observers, arrangements, Negotiations, enterprises, proceedings, witnesses, Adolescents, mandate-holders, organisations, clearers, co-venturers, believers, prisoners, statements, Sportsmen, men, protagonists, policyholders, leaders, sanctions, stake-holders, recognition, anglers, interests, protesters, enthusiasts, assignments, classmates, detainees, essentials, advocates, documents, Fishermen, except, scholars, Opportunities, advisers, shareholders, counterparts, acteurs, personages, bidders, actions, fighters, advisors, contacts, customers, competencies, commissioners, incumbents, athletes, courses, portions, audiences, disciples, visitors, performers, groupings, Activities, Entities, Entries, registered, objects, outcomes, workers, colleagues, internet, projects, fellows, shared, conferees, reservations, details, awardees, Governments, Countries, employees, Undertakings, item, items, managers, viewers, venturers, authorities, users, policymakers, awareness, references, outreach, retirees, processions, terms, enrollees, guests, Lectures, Communities, voters, farmers, assets, intakes, edits, CADETS, T, producers, clusters, Nurses, contents, fishers, sessions, departments, CREWS, Children, encounters, briefings, pensioners, concerns, recruits, directions, respectively, nations, protestors, live-aboards, methodologies, unit-holders, substances, Suggestions, Populations, Stations, mourners, seekers, expressed, discussions, helpers, toronto, talks, notices, reviewers, elements, earnings, Deputies, tanks, clientele, Constituencies, Voices, others, referees, authors, sitting, marchers, Pupils, leadership, findings, kids, contexts, youngsters, portfolios, councillors, followers, tools, personnes, Pregnancies, results, conclusions, places, courts, sealers, underlined, Accessories, top, counsellors, girls, seats, academics, dialogue, wizards, words, affiliates, Laboratories, Companies, circles, humans, Forums, subjects, comers, officers, Industries, L, skills, sections, spaces, delegations, jobs, hours, controls, escorts, profiles, responses, shares, submissions, Categories, aides, nominees, harvesters, quarters, Conferences, Served, exchanges, Rallies, juveniles, graduates, target, targets, personnel, hunters, protests, eyes, names, sources, debates, Workshops, Rights, issues, questions, reading, materials, NATIONALS, MMPs, officials, sectors, programmes, regions, Fisheries, Areas, institutions, opinions, themes, Sports, Females, condolences, numbers, takes, Firms, fully, fields, Gases, beings, days, Agencies, Leaves, Elles, Ones, Roles, Youths, staffs, participating, Securities, ec, jeunes, views, groups, supplies, schemes, Programs, guys, series, vision, Ideas, peoples, sides, Has, Assemblies, cases, figures, welcome, Studies, maybe, Classes, four, Bodies, titles, hotels, media, informants, works, Lives, D, Forms, Respondents, states, Having, is, 29, e, Businesses, =, co-sponsors, problems, trainees, interns, presenters, Students, Internships, meetings, intervenors, Organizations, Caregivers, ministers, professionals, responders, Your, providers, women, -lsb-, have, Participated, panellists. participating, participation, respondent, trainee, panellist, informant. characterized, emphasized, Discussed, suggested, contacted, observed, highlighted, Was, felt, Were, Participated, involved. Contributed, assisted, interviewed, joined, assembled, Reached, Surveyed, felt, expressed, Served, Participated, involved. Behind it, as a prop to its stability, was the strict tradition of Christianity, an inheritance of peculiar influence with both the participants in the strange mistake.